Get beautiful skin….NOW! 🙂 thanks “Sheslosingit”! 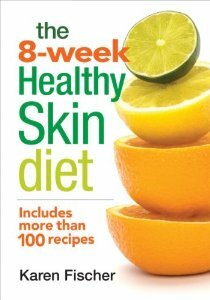 The 8-week Healthy Skin Diet by nutritionist Karen Fischer is a pretty interesting read. I’ve always focused on diet with respect to weight loss but this book offers nutrition suggestions for improving your skin. After explaining the make up of skin she lays out eight guidelines for healthy skin, from restoring your pH balance to making the case for beauty sleep. The most interesting/disturbing part dealt with selecting safe and effective beauty aids. Did you know some skin products contain formaldehyde?! And there are many more ingredients and additives in creams, cleansers and fragrances that manufacturers use for cost savings but they are actually terrible for your skin. She spells out each ingredient and why it causes problems for various skin types. She also names the best ingredients for your skin. Where else may just I am getting that type of information written in such an ideal method? I’ve a venture that I am just now working on, and I’ve been on the look out for such information.